The University’s only student-owned coffee shop, Common Grounds, is now under a review driven by TRUSU Services Committee. This decision, announced in early September, comes after the launch of the Food Services Consultation being performed by TRU, who are currently reviewing food and beverage retailers on campus with help from surveys completed by students. TRUSU now has their own survey online for the purpose of letting students provide comments and feedback on their experiences with the Common Grounds coffee shop. 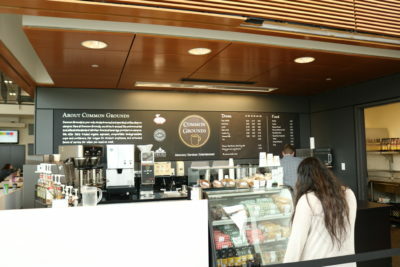 “Common Grounds has not had a review in the eight years since it’s been open, so it’s really important to conduct a review when you’re operating a business and we think it’s really important to hear what students, staff and faculty want to say about Common Grounds as our main customers,” said Samantha Baker, TRUSU’s vice-president services. While there wasn’t a clear reason why Common Grounds hasn’t gone into a review period in the past, the current review system is set up to gather responses from students, staff and faculty on the quality of food, beverage and service on TRUSU’s online survey. The survey takes roughly five to ten minutes to complete online. “We’re hoping to hear that we’re doing well, but we’d also like to hear on what we can improve on, whether it’s our food services or coffee services, even our hygiene or facilities,” Baker continued. While Common Grounds and TRUSU haven’t begun looking at the data they have collected so far, from both online surveys and physical surveys at the coffee shop, Baker commented that the responses will be gathered in full by the end of the semester. Once completed, the data and final results of the surveys will go to the Board of Directors to begin any changes that the Board deems necessary. When asked about any budget that TRUSU has to allocate to any upcoming Common Grounds projects, Baker said that she was not aware of any immediate numbers, saying that those decisions would be made after all the information was collected. The Common Grounds review survey is currently up on the TRUSU website and will be accessible for the next few weeks for students, staff and faculty to participate in and voice their opinions on the student-owned coffee shop.